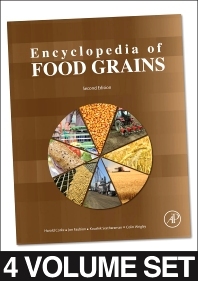 The Encyclopedia of Food Grains is an in-depth and authoritative reference covering all areas of grain science. Coverage includes everything from the genetics of grains to the commercial, economic and social aspects of this important food source. Also covered are the biology and chemistry of grains, the applied aspects of grain production and the processing of grains into various food and beverage products. With the paramount role of cereals as a global food source, this Encyclopedia is sure to become the standard reference work in the field of science. Responses to the environment; physiology disorders; physiology and development; grain composition; grain technology; food production and nutrition; cereal breeding technology; storage of food grain. Colin Wrigley’s 54 years in grain-science research have earned him international recognition, in the form of several international and Australian research awards. His work is described in about 600 research publications, including several patents, a series of eight books on Australian cereal varieties and many edited books. He was Editor-in-Chief of the first edition of the Encyclopedia of Grain Science (2004). His research interests have centred on the characterisation of cereal-grain proteins in relation to processing quality. This has involved developing new methods of protein fractionation, including gel isoelectric focusing and its two-dimensional combination with gel electrophoresis, leading into proteomic mapping. Other diagnostic methods developed relate to the evaluation of grain quality in wheat and barley, such as better methods for variety identification and for characterizing quality in starch and sprouted grain (as co-patentee of the Rapid ViscoAnalyser). Research involvement has also included elucidation of grain-quality variation due to environmental factors (heat stress, fertiliser use, CO2 levels and storage conditions). He is currently an Honorary Professor at the University of Queensland, Brisbane, Australia. Dr. Harold Corke is a professor in the Food and Nutritional Sciences program at The University of Hong Kong, and a Chutian Scholar Distinguished Foreign Professor in the Glyn O. Phillips Hydrocolloid Research Center at HUT, Hubei University of Technology, Wuhan, China. In more than 22 years in Hong Kong, he has had responsibility for teaching a diverse array of food science courses, including the major courses Grain Production and Utilization, Food Safety and Quality Management, Food Product Development, and general education courses Feeding the World, and Food: Technology, Trade and Culture. He is author or co-author of 180 refereed journal articles, and his 22 PhD graduates have gone on to successful careers in academia and industry around the world. He is on the editorial boards of Journal of Food Composition and Analysis, LWT Food Science and Technology and Journal of Cereal Science, and with Colin Wrigley and Chuck Walker was one of the editors of the first edition of Encyclopedia of Grain Science, published in 2004. Dr. Corke is active in consulting in grain processing and food safety in Asia and Eastern Europe. Dr. Jon Faubion is the Charles Singleton Professor of Baking and Cereal Science in the Department of Grain Science, Kansas State University. Over his 35+ year career, he has had the sole or shared responsibility for teaching 9 different cereal or food science courses at Texas A&M University, The University of Minnesota and Kansas State. In 2011, he received the Excellence in Teaching Award from the American Association of Cereal Chemists International. He is a senior editor of Cereal Chemistry, and a member of the Board of Directors of the American Association of Cereal Chemists International. and an executive editor of Journal of the Science of Food and Agriculture. Prior to rejoining the department faculty in 2005, he directed the Applied Technology and Sensory Science Groups for the research and development arm of The Schwan Food Company.